I’ve admired Sansahash‘s cool patterns for a while now and when they put a call for new pattern testers to join their testing team I jumped in with an application. I was delighted to be invited to join the team! The first chance to test a pattern was for their Niva Leggings. This lovely simple pattern was the perfect opportunity to settle into some New Year pattern testing. This is Sansahash’s first free pattern and you can get it via their blog here, or by heading over to the pinned post in the Sansahash Sh-ew & Tell Group on Facebook!! No.3 has grown out of many of last summer/autumn’s sewing so I was delighted to make a few new pairs of leggings for her. The pattern is designed to be sewn with stretch faux leather, and this certainly creates a superb look, and also works perfectly with knit fabric with 25-50% stretch. I had a look around local fabric shops but couldn’t find any appropriate faux leather so instead raided my stash of jersey fabric. Stunning Elvelyckan Design fabric from my (ever expanding) stash! Mgeni (the boss over at Sansahash!) paid very close attention to the accurate blending of pattern sizes by the testers. This approach ensures accurate testing and feedback on sizes, hopefully ensuring a really well working pattern! She was also able to advise on the adjustments needed to the full-rise to accommodate a nappy. For a simple pattern great care has been taken to achieve a really good fit. It proved a little tricky to achieve a good fit to the calf area of the leggings for every tester, as children can have very varied leg proportions. One of the testers suggested the inclusion in the tutorial of a table with calf measurements. This great was a great suggestion ensuring really good fitting leggings can be achieved for all shapes!! The leggings of course need pairing with a top half and I chose to make two final sets, both made up of the Niva Leggings paired with Sansahash’s Lilah Top. I added a bit of length to the back of the skirt part of the Lilah Top, giving a lovely high low look; maintaining the higher front, thus still showing off the Niva Leggings, while affording a little more growning room!! A while back, during their sale I “invested” in a big (for me) order of fabric from Elvelyckan Design. 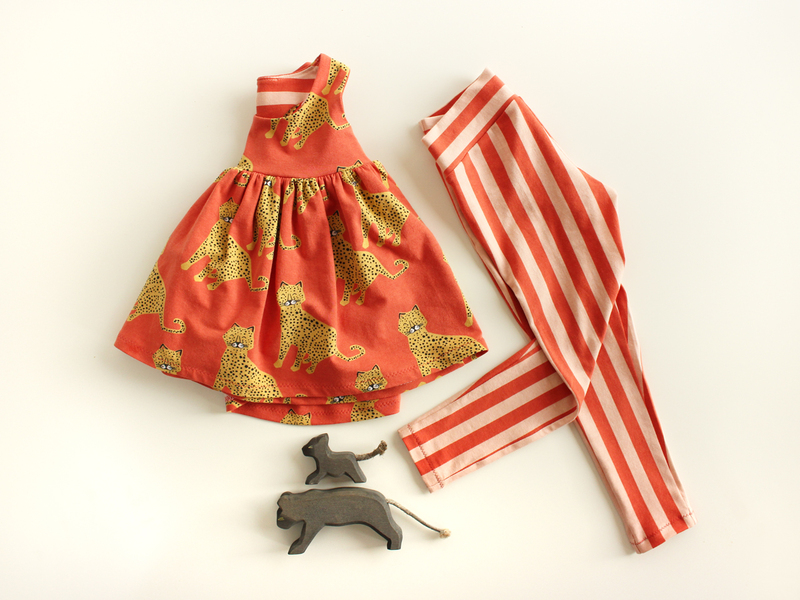 For my first Niva/Lilah combo I used their “Leopard – Ginger (024)” printed jersey for the Lilah top paired with their vertical striped jersey. 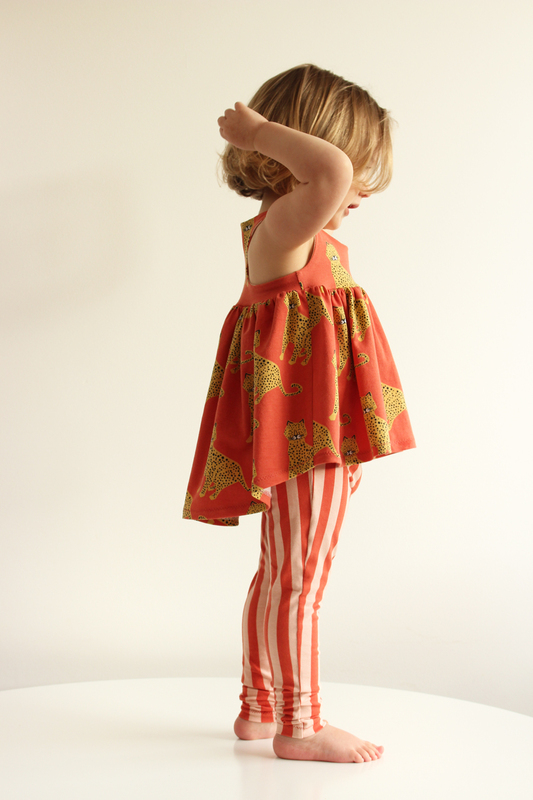 It was my first time sewing the Lilah pattern and it came together beautifully. I had never used the “burrito” method to sew lining into a garment before. The instructions were very clear and I was delighted with the result. The addition of some length to the back will hopefully give a little more growing room!! A beautiful sunny winter’s morning made for some lovely photos of No.3 in her gorgeous new outfit. Here’s hoping spring arrives soon so she can get some great wear out of it! Check out some of my fellow testers’ amazing makes!! Who knew they had Cheerios in space?? One the first lovely jersey fabrics I bought, about a year and a half ago was some space patterned jersey from Madeline de Stoffenmadam and I still had a little left in my stash. Just enough to make another pair of Nivas. Beautiful winter light falling on this lovely space-themed set of Niva and Lilah. I appliqued a little spaceman from this fabric onto the front of her Lilah, and an little rocket onto the back lining. The white sweater fabric came from Quilt Yarn Stitch and I used grey interlock from Elvelyckan Design for the skirt and the lining. All so lovely and soft!! Perfect for wearing with her favourite dressing up item – her brother’s astronaut helmet. I really enjoyed testing the Niva pattern; a gentle warm up to this year’s sewing!! Huge thanks to Mgeni for the opportunity!! I’m looking forward to the next chance to test for her and looking forward to another great sewing year! The pattern is released today, 4th February 2019, and tomorrow I will be hosting a giveaway of a free copy of the Lilah pattern on my Instagram page!! Now relax and browse through some more of the wonderful variety of Sansahash outfits made using the Niva Leggings made by my fellow testers. I love both your outfits madevwith the Niva. You are an inspiration for me! Oh thank you so much! Love this pattern, and really love the Lilah top with it. Just have to wait for some warm weather now! !